QuikDot Pro from Glue Dots International is a pressure sensitive adhesive applicator designed to reseal paper, board and corrugate packaging that has been damaged or where the original adhesive has failed. 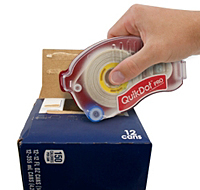 The QuikDot Pro is a convenient alternative to cumbersome tape pads and hot melt glue guns. Designed for time savings and ease of use, the QuikDot Pro refillable design fits easily into the palm of the hand. The QuikDot Pro is a durable, compact adhesive applicator engineered to instantly apply the right amount of adhesives, every time. The refillable, pocket-size design offers a new level of flexibility and convenience, while the high impact polycarbonate body stands up to rugged everyday use. QDP Adhesives are available in two formulas (QDP-7100 and QDP-8100) engineered specifically for paperboard and corrugate food and beverage packaging repair. The adhesive shape and pattern spacing are engineered to provide optimal coverage while eliminating waste. The invisible bond protects brand integrity with a dependable seal that is virtually invisible to consumers. Don’t come unstuck, talk to the glue experts !